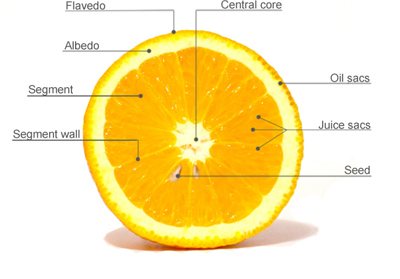 From the latin name for Orange – Citrus Sinensis – we can draw the conclusion that the fruit originates from China. The name in Germanic languages – Apfelsin or Apelsin – actually means “Apples from China”. The fruit was brought with traders from the originating area to Europe where it was grown in the Mediterranian countries and then it moved further west and reached the Americas during the discoveries in the 16th century. Today you will find Oranges in the northern and southern hemisphere between the 20th and the 38th latitude, i.e. in the sub tropical regions. The total production of Citrus fruits in the world is about 100 Million Tons of which Oranges accounts for more than 60%. The biggest producers of Oranges are Brazil, USA, China, Mexico and Spain but you will find Oranges in virtually every country in the sub tropical areas. 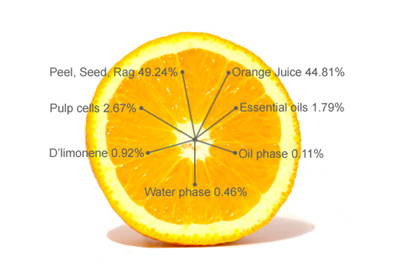 Commercial production of Orange Juice is much more concentrated. Brazil and USA accounts for 90% of the total world production. Other producers are Mexico, Cuba, Italy, Spain and South Africa. Eating the Orange was the only way to consume it up until around 1910. At that time there was a big surplus of Oranges in California and growers started to cut down their trees. California Fruit Growers Exchange, later known as Sunkist, hired an advertising agency to help them increase sales. They came up with the slogan “Drink an Orange” and very soon the orange eaters in USA were also Orange Juice drinkers. After WW2 the habit of drinking Orange Juice spread over the world and gradually increased to the multi billion dollar business it is today.